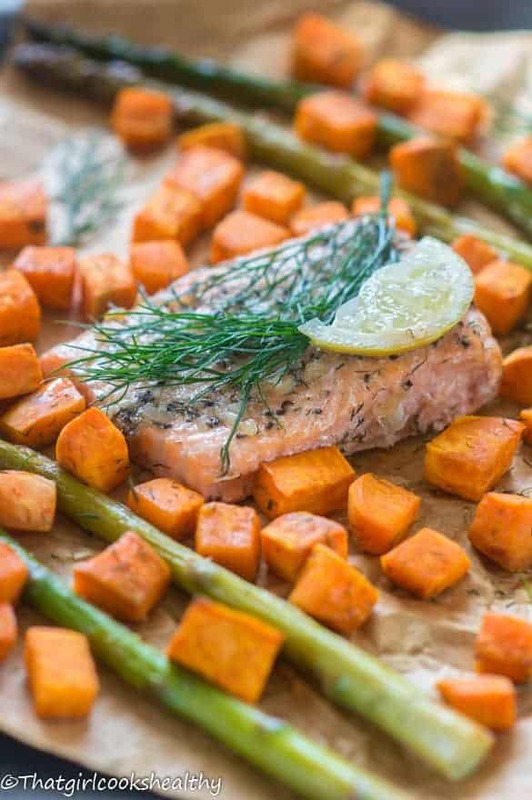 Baked salmon with asparagus recipe – oven baked salmon fillets with asparagus spears and served with cubed sweet potatoes. As you already know I’m a staunch proponent of quality control which means I take time to not only create the recipes from scratch but also test them a fair amount of times to ensure the taste is to a high standard. This is why I’m so pleased to share this baked salmon with asparagus dish with you all. Anyway, with that out of the way salmon is high on the agenda, a favourite of mine albeit expensive. There are so many ways to cook salmon it’s unreal – bake, steam, grill, fry etc… I enjoy baking salmon as opposing to frying it as sometimes pan frying with copious amount of condiments gives off a heavy taste. 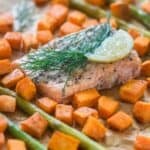 This baked salmon recipe is quite light in terms of flavour, nothing to weigh down the salmon fillet. 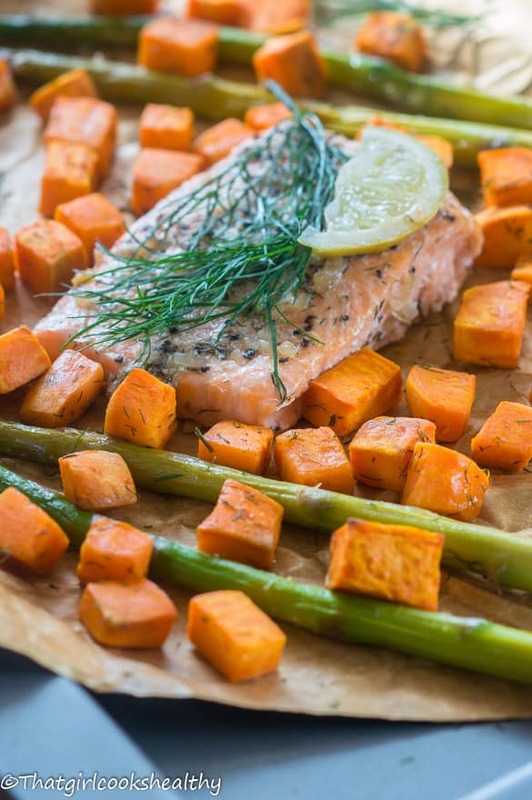 The asparagus and sweet potatoes are lightly coated in coconut oil to prevent them from being too dry. I used a fork to carefully prick a few shallow holes into the salmon fillets. This will help the wet rub penetrate some what and as mentioned, coated the asparagus in coconut oil. You can bake them in a makeshift foil pouch or use foil sided baking paper, not the exclusively brown type as this will seep through the entire layer of paper. Another thing to note is that the sweet potatoes were cubed and cooked in a separate baking pouch. The reason why I did this was to prevent the sweet potato from becoming too saturated in the asparagus and salmon oil. Cut 2-3 (depending on the amount of salmon used) foil or foil coated baking sheets into about 15 inch long. Cut an additional sheet to accommodate the sweet potatoes. In a bowl, add the salmon fillets and proceed to generously coat each fillet with the wet rub ingredients. Feel free to add more if required. Place the salmon pouches and divide the asparagus spears into each packet. Wrap each packet over the salmon and roll over each end so they enclose and seal completely. 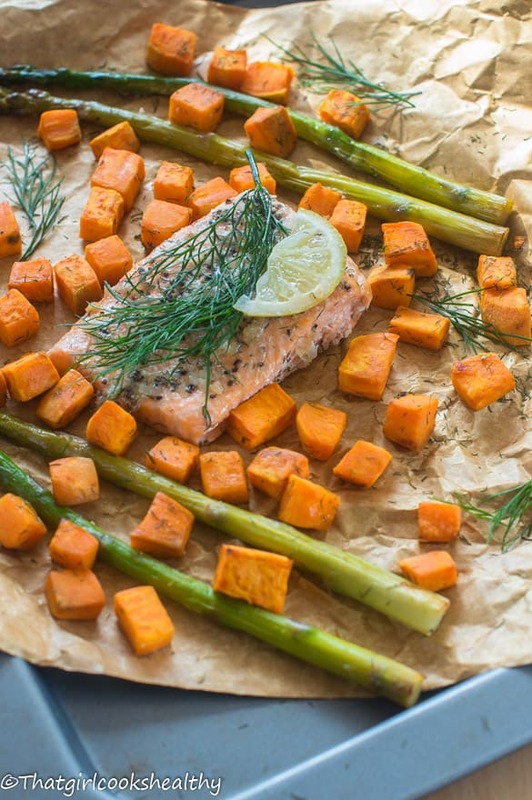 Follow the same principle with the cubed sweet potatoes, place in the pouch, wrap and seal the ends. Place everything on a large baking sheet and cook for roughly 25 minutes until everything is cooked through. Salmon is such an easy and delicious protein. Perfect for an elegant dinner, or a quick weeknight meal. Love it. Salmon is such a great tasting protein. Perfect for an elegant meal, or a quick weeknight dinner. Yum! Love how simple and healthy this is!! I like simple recipes that are tasty and easy to prepare like this one. I love meals that just need one baking pan and a warm oven! Delicious! Definitely! Simple and low prep meal. It works for everybody! Yeeeep, I’m now craving this whole bowl and I don’t care it’s not even 7am yet. Holy MOLY, Denise!! This salmon is dropdead gorgeous!